Nation Council-JCM to finalize agenda for National Anomaly Committee arsing out of 7th Central Pay Commission. 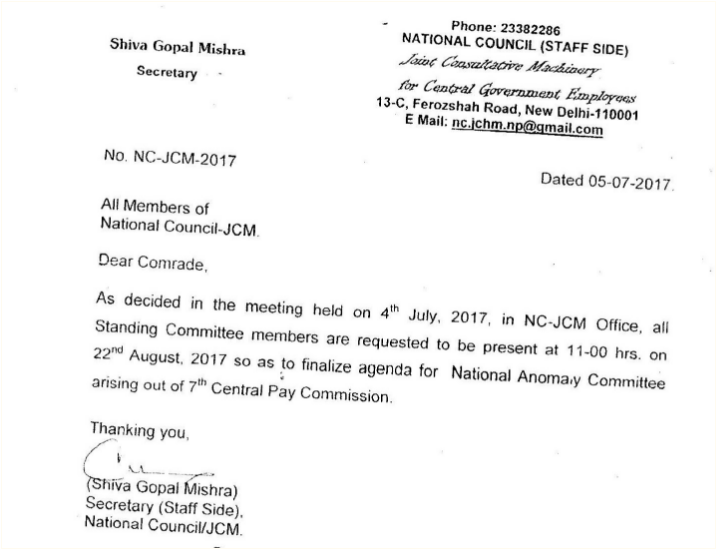 As decided in the meeting held on 4th July 2017, in NC-JCM Office, all Standing Committee members are requested to be present at 11.00 hrs, on 22nd August,2017 so as to finalize agenda for National Anomaly Committee arsing out of 7th Central Pay Commission. 7th CPC Pay Anomaly: NC JCM to finalize agenda for National Anomaly Committee(NAC) on 22nd August,2017, As decided in the meeting held on 4th July 2017, in NC-JCM Office, all Standing Committee members are requested to be present at 11.00 hrs, on 22nd August,2017 so as to finalize agenda for National Anomaly Committee arsing out of 7th Central Pay Commission.